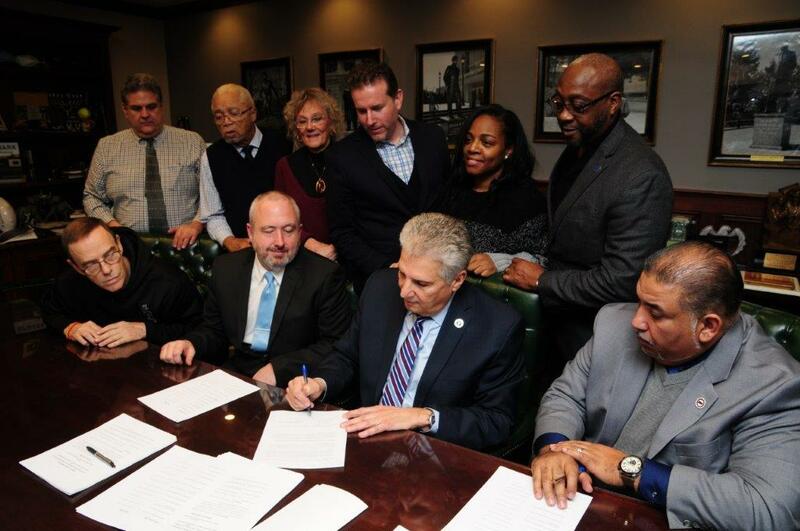 Newark, NJ – Essex County Executive Joseph N. DiVincenzo, Jr. joined with the Essex County Schools of Technology to sign a Project Labor Agreement with local construction trades unions on Wednesday, January 30th. The agreement ensures that union workers will be hired to work on the renovation and expansion of the Essex County West Caldwell School of Technology. This summer, the building will undergo a $30 million makeover.“We are improving our West Caldwell Campus to ensure our students have the most modern classrooms in which to learn. The West Caldwell school facilities are outdated and must be modernized so they can accommodate and meet the needs of our progressive academic curriculum,” DiVincenzo said. “We are pleased to partner with our local building trades unions to provide the trained and professional workforce to update our school building. This project is an opportunity to create jobs and provide a school facility that will meet the needs of our students for generations to come,” he added. “We are eager to start work on the West Caldwell School project. We appreciate the relationship with the County and appreciate how you feel about the importance of the building trades unions,” said Lino Santiago, Business Representative with the international Union of Operating Engineers Local 825, who represented the construction trades unions. “I grew up in a union family and I understand how important this is for the men and women represented by labor. I thank the County Executive, our contractors and unions for creating a great environment for our students to learn,” Essex County Schools of Technology Board President Father Ed Leahy said. “I want to thank the County Executive for providing our school district with the resources it needs to modernize and all of our school buildings, including our West Caldwell Campus. This is another exciting project taking place in our district and we welcome the support of the unions to get this completed for our students,” Essex County Schools of Technology Superintendent James Pedersen. “A Project Labor Agreement is not an abstract concept. We understand the importance of our labor unions and the role they play in constructing our infrastructure and buildings,” said Freeholder President Brendan Gill, who was accompanied by Freeholder Vice President Wayne Richardson and Patricia Sebold. At the end of the current school year, work to completely renovate the Essex County West Caldwell School of Technology will begin. A two-story addition will be constructed onto the front of the building and the existing structure will be completely updated. Being improved are facilities for the Career and Technical Education Construction Lab, greenhouse, media center, cosmetology, music production, and culinary and baking programs. There will be eight new classrooms, a new multi-purpose room for physical education and performing arts classes, a new weight room and a renovated cafeteria and kitchen. In addition, security systems will be upgraded. DiCara Rubino Architects from Wayne was awarded a professional services contract for $1,790,000 to design the improvements and classroom addition. Dobco, Inc. from Wayne was awarded a publicly bid contract for $29,855,000 to perform the construction work. Joseph Jingoli & Sons, Inc. from Lawrenceville received a $840,855 contract to serve as the construction manager of the project. Promatech, Inc. from New York City was awarded a n$81,307 contract to serve as the contract monitor and compliance officers on the project. The school construction project is being funded with a grant from the State of New Jersey. The Essex County Schools of Technology District is New Jersey’s first and one of its largest Vocational Technical School Systems. Created in 1914, the school system provides both occupational and academic instruction for high school and adult students in Essex County. In addition, the system provides adult programs in the evening at its Adult Training Center at Newark Tech. The district has an enrollment of approximately 2,200 students and provides high level state-of-the-art career skill development and academic opportunities in over 25 occupational areas. For more information on Essex County’s Vocational Technical Schools, visit HYPERLINK “http://www.essextech.org” www.essextech.org.